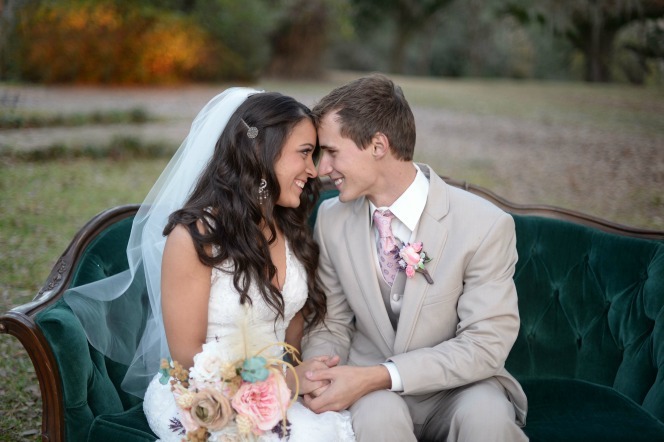 Daniel and Andrea planned a beautiful outdoor wedding with lots of personal and vintage detail. Every bride is sure to be inspired! Click here to see a quick video of the wedding. 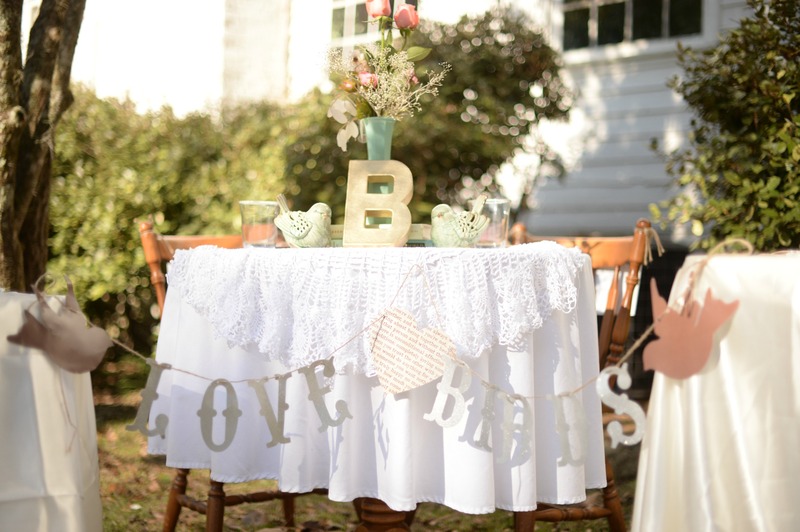 To bring in the the chosen vintage colors, we made tissue paper flowers which cost very little but looked great with the burlap ribbon. 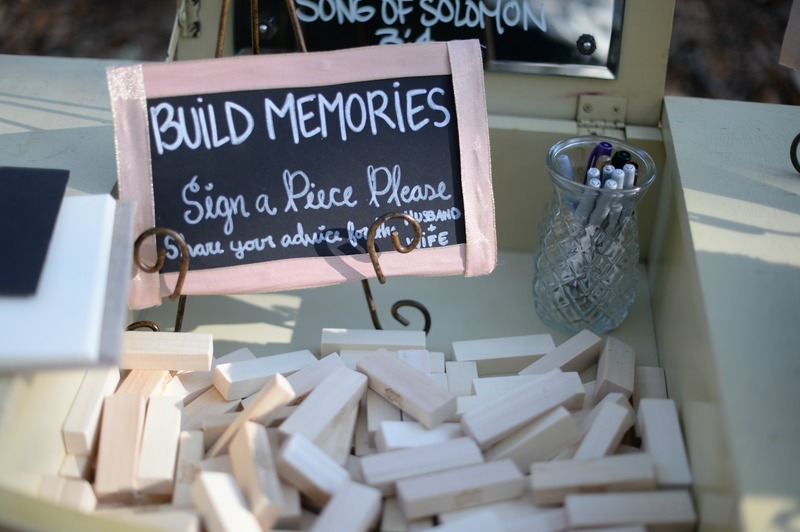 For an outdoor wedding you would want to pin them to a ribbon runner or weight them with something so that the wind doesn't blow them away. 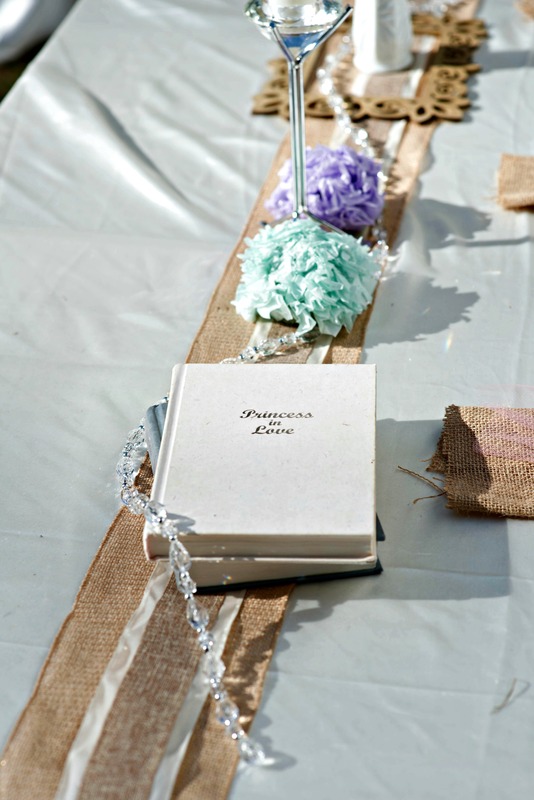 The hardcover vintage looking books were purchased from a thrift store for a few dollars apiece, but if you like that idea for your wedding, you might be able to borrow them from friends. The lovely wood scroll frame above was purchased from a craft store and then spray painted with gold paint. Several vases purchased form a thrift store for about $1.50 each were also spray painted in the select colors. A little lace, like the one in the link below, added a dainty touch. 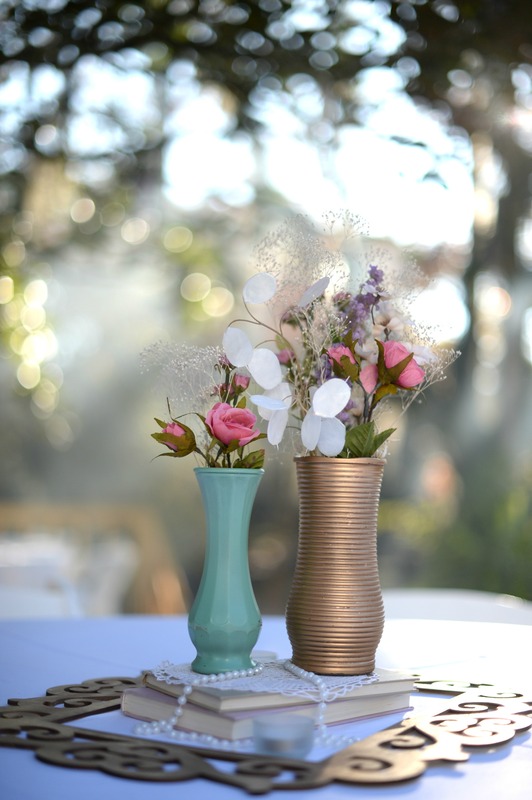 Since these were cost effective, heavy enough not to blow away, and romantically nostalgic, they adorned several tables at the wedding. Paper cut outs in just the right spot, like the birds above, add a special little touch. 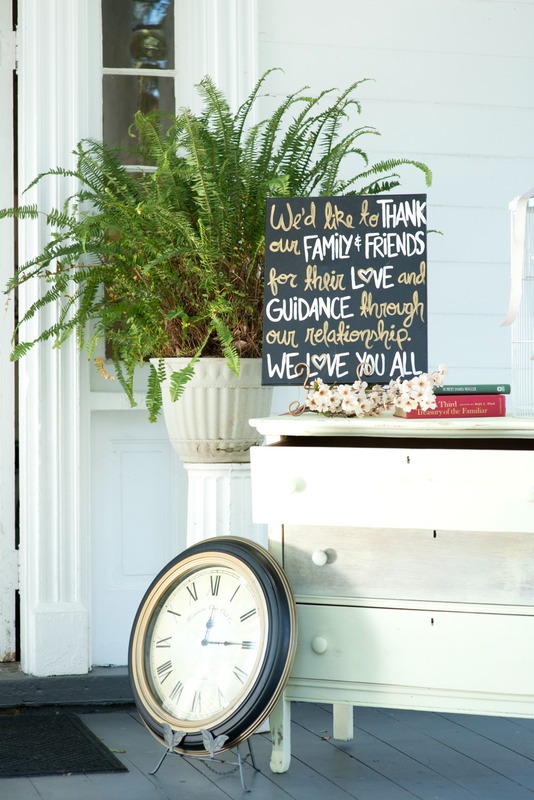 Something as simple as a black poster board written on with sharpie markers can become an eye catching sign. 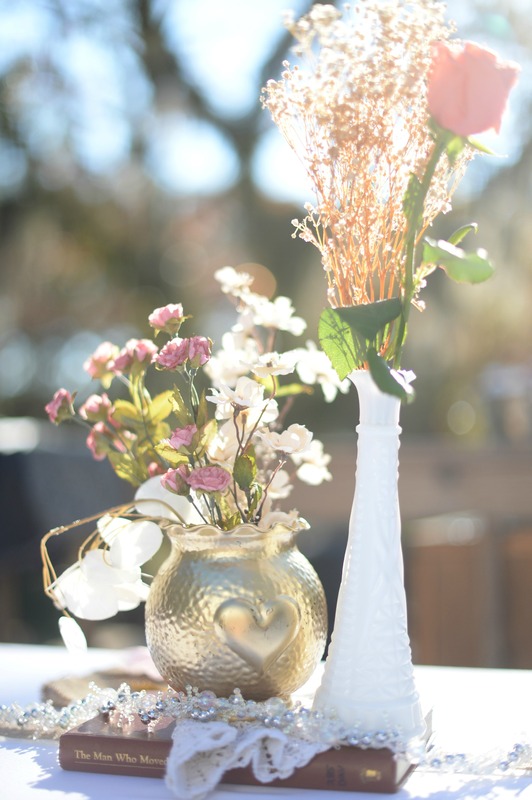 Get your brain whirling with things you'd like to incorporate that would make a great little accent around your wedding site. Remember that it should be something that can be secured or weighted enough so that it can be used outdoors. 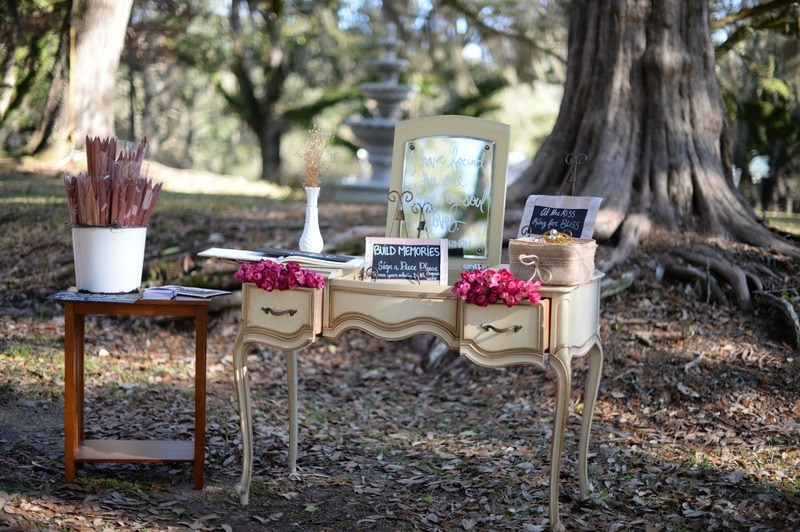 (If that is relevant to your wedding) Borrow what you can, check out the thrift stores and the craft stores. Make a quaint little sitting area with your own furniture or something a friend, or family member, maybe even a neighbor or co-worker would let you borrow. 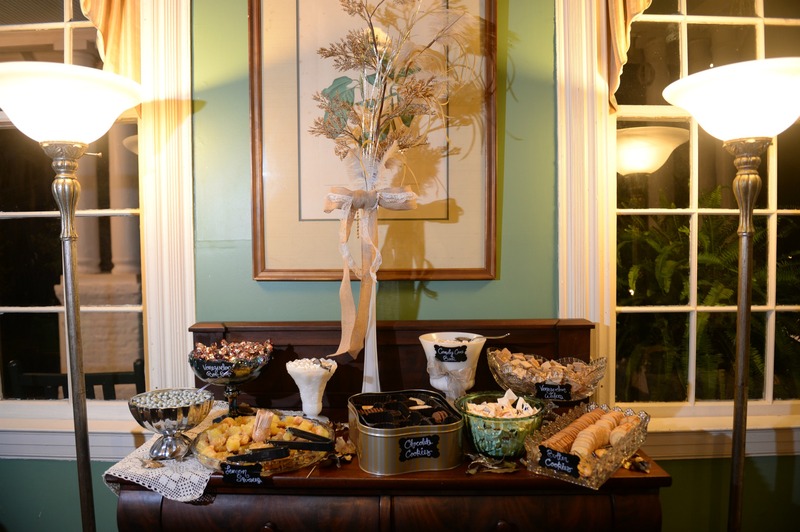 Just one great piece strategically placed at the entrance to the wedding would set the tone of the entire wedding. Notice that not many flowers were added to these areas. 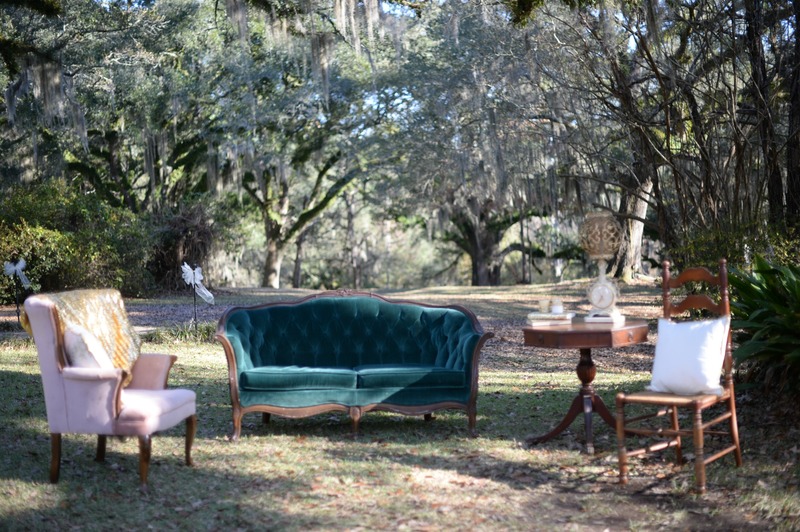 The natural beauty of the surroundings is more than enough to make this a wonderfully beautiful setting. And it being under trees kept anyone using the area safe from the Louisiana sun. 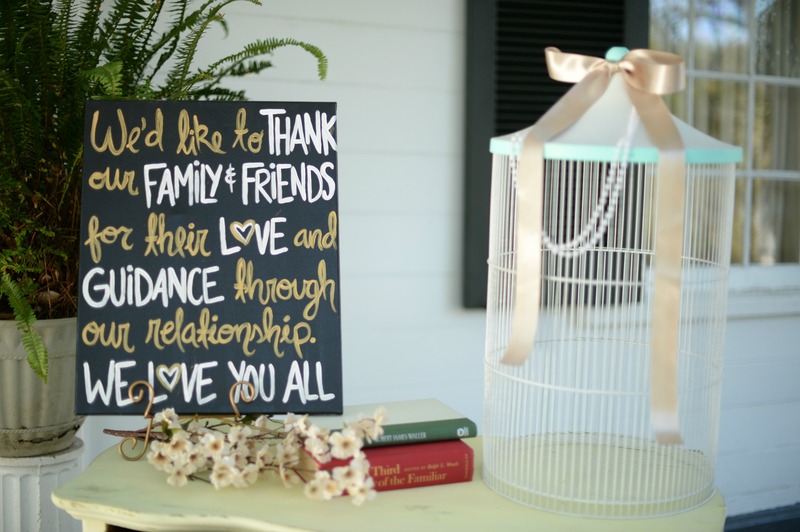 Andrea chose a cute little idea for her guestbook. No pages blowing in the wind when you use blocks of wood. She used natural wood blocks, but colored ones would be great too. Another good idea would be rocks, which can be purchased at craft stores. 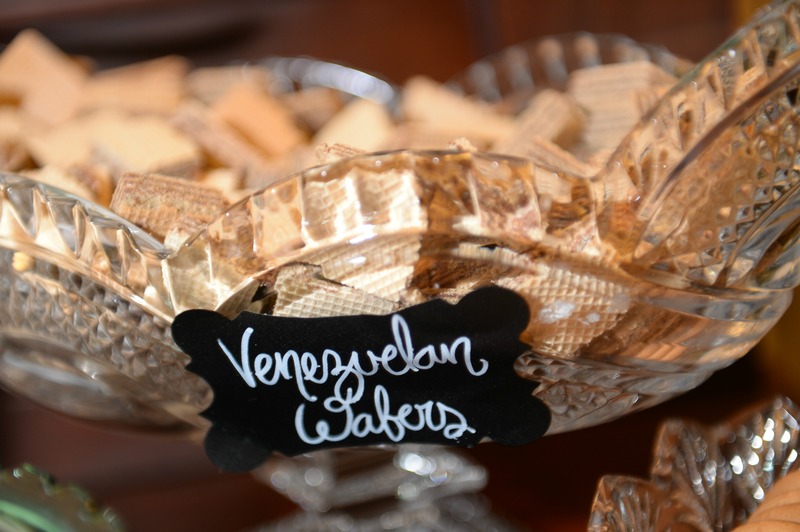 Because Andrea is from Venezuela, she decided to have a little special treat on her candy table. Take time to look at other real wedding photos.